Year 2000, October, Friday the 13th, it was full moon, at 10:30 a.m, I first arrived here in Alaska. I was amazed when I saw and touched the snow for the first time ever.. I just can't believe it! I was so tired from a long trip that as soon as I walked in the house, I went looking for bed.. When I woke up, Joel took me to restaurant for dinner then we went to Fred Meyer. Joel had a good story about this but I won't tell..anyways, I was kind of shocked when I saw the store, I was thinking this is not a store, this is a warehouse. . One thing I admit though, even being far away from my family and friends, I didn't get home sick.. well, now and then I do but Joel really take good care of me. 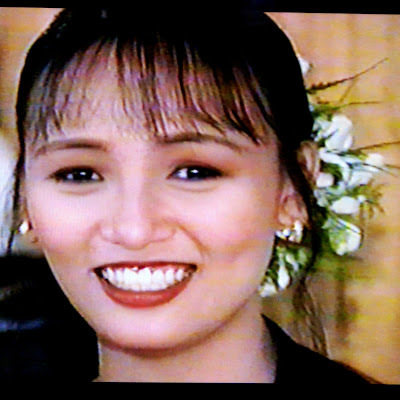 I capture this photo from my T.V screen, it was from my wedding VHS tape 12/12/98.